It is finally FOOTBALL time in TENNESSEE! Woo Hoo! If you have never experienced football time in the SEC, you have no idea what you are missing! We take our SEC football SERIOUSLY! 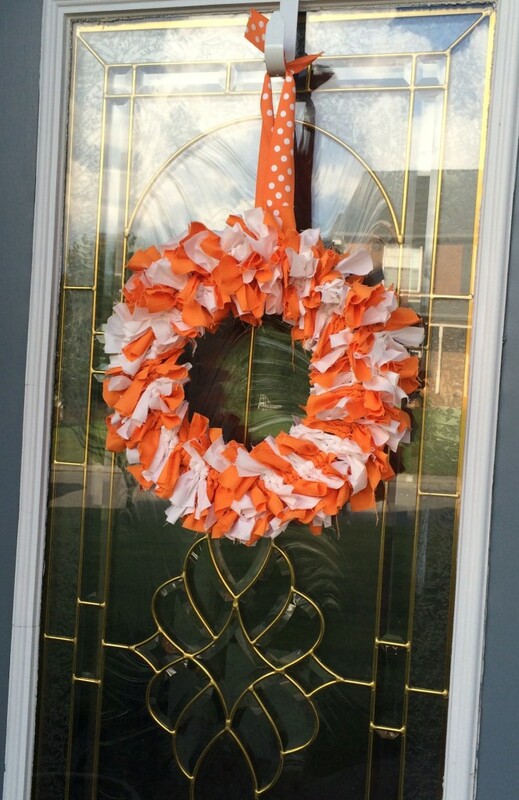 I saw this easy and simple wreath idea on Pinterest and knew that I had to make one to support my Vols this season! All total, this wreath took me about 1 1/2 hours to complete from cutting the fabric to tying all the strips on. It was super easy. To start with, you will need an 8-inch metal wreath frame. If you are doing 2 colors, you will need 3/4 of a yard of each color. Then any other decorations and a ribbon to hang. It’s THAT easy. To cut the strips of fabric, measure out 6 inches long by 1 1/2 inches wide. To make this easier, I folded my fabric every 6 inches and then went through and cut the 1 1/2 inch strips. Just make sure to keep your cut lines as straight as possible, but the great thing with this is that it doesn’t have to be exact! Now that you have your strips, begin tying them on. You will just make a simple knot and then move on to the next one. I used the outermost ring and the 2nd ring from the center. I went in an alternating pattern of 3 orange, 3 white, all the way around the wreath. When it was complete, I tied some ribbon on the metal frame and made a loop to hang the wreath. This is a project that you can easily do while watching TV and it goes by really fast. If you don’t have time and would really like one, they can be found at my Etsy store, KiwicatCreations, and I will make a customized one with your teams colors! Fast turnaround time so you can use for the rest of the season!